Shown below are veterans of the American Civil War known to have resided in Madison County, Iowa, either before the war, after the war or both, their rank and unit in which they served, and their service if known. County Coordinator's Note: The names of veterans serving from Madison County are readily obtainable. The County Coordinators would welcome your inputs for data on veterans who lived in Madison County but served from elsewhere. We would also welcome the submittal of photographs of any of these veterans as soldiers in uniform. Highlighted Name - click name to see photo of soldier in uniform. Mack, Wilmoth E. Private, Company B, 64th Ohio Infantry Enlisted 31 Jan 1865, discharged for disability 14 Sep 1865 at New Orleans, La. Maggs, John Stewart Wagoner, Company A, 39th Iowa Infantry Enlisted 22 Aug 1862, mustered out on 05 Jun 1865 at Washington, DC. Marchel, James Private, Company H, 23rd Iowa Infantry Enlisted 09 Aug 1862, mustered 29 Aug 1862, mustered out 26 Jul 1865 at Harrisburg, Texas. Mark, Lewis H. Private, Company F, 10th Indiana Infantry Enlisted 18 Sep 1861, discharged 29 Aug 1862 at Indianapolis, Indiana. Marler, Stephen Alexander Corporal, Company G, 106th Illinois Infantry Enlisted 05 Aug 1862, discharged for disability 24 May 1865. Coordinator's note: It is probable that Stephen was not a resident of Madison County but rather lived in Clarke County at the time of his death. This entry may be moved to Clarke County if a comparable web page becomes available. Marler, William Private, Unassigned, 106th Illinois Infantry Enlisted at age 14 or barely 15, discharged 14 May 1864, probably for under age. Martin, Andrew C. Private, Company F, 4th Iowa Infantry Enlisted 01 Jul 1861, discharged 01 Dec 1862 at Helena, Arkansas. It is believed that he also went by "Alexander C. Martin". McCombs, Hugh D. Private, Company M, 2nd Iowa Cavalry Enlisted 28 Sep 1861, mustered out 03 Oct 1864 at Davenport, Iowa. McGinnis, George Private, Company C, 34th Iowa Infantry Residence Saint Charles, nativity Pennsylvania. Enlisted 13 Aug 1862, mustered 15 Oct 1862. Died of disease 21 Apr 1863, St. Louis, Missouri. Buried in National Cemetery, Jefferson Barracks (St. Louis), Missouri Section 2, grave 69. McLaughlin, Frank J. Private, Company E, 47th Iowa Infantry Enlisted 04 May 1864, mustered out Sept. 28, 1864, Davenport, Iowa. Miles, Henry Hamilton Private, Company G, 10th Iowa Infantry Enlisted 01 Sep 1862, mustered 01 Sep 1862, mustered out 28 May 1865 at Washington, D.C.
Miller, Andrew Private, Company K, 15th Iowa Infantry Enlisted and mustered 28 Sep 1864, mustered out 02 Jun 1865 at Washington, D.C.
Miller, Brison S. Private, Company C, 1st Oregon Cavalry Service unknown...listed in obituary. Miller, John T. Private, Company I, 15th Kansas Infantry Unknown - "Civil War Veteran" on tombstone. Miller, Valentine Private, Company A, 49th Pennsylvania Infantry Enlisted 1862. Note: this veteran may have lived in Warren County and joined St. Charles G.A.R. Post because of it's proximity. Monteith, John W. Musician, Company C, 34th Iowa Infantry Enlisted 13 Aug 1862 as Drummer, mustered 15 Oct 1862. Died of disease 25 Aug 1863, Carrollton, Louisana. 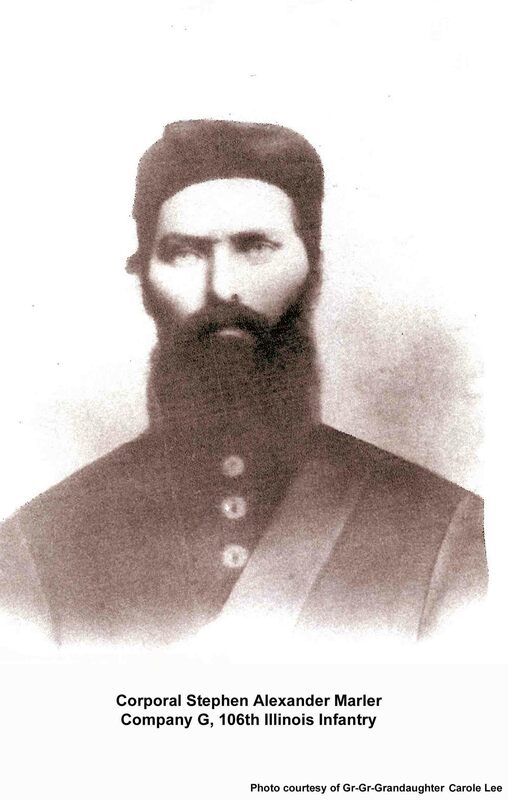 Montgomery, Samuel L. 1st Sergeant Veterans, Company I, 4th Iowa Cavalry Enlisted 25 Oct 1861, as Fourth Corporal. Mustered 05 Dec 1861. Promoted Third Corporal 28 Feb 1862; Second Corporal 18 Jun 1862; Fifth Sergeant 18 Oct 1862; Fourth Sergeant 01 Nov 1862; Third Sergeant 01 Feb 1863; First Sergeant 01 May 1863. Re-enlisted and re-mustered 19 Dec 1863. Died of disease 15 Jun 1864, Memphis, Tennessee. Buried in Mississippi River National Cemetery, Memphis, Tennessee. Moore, Thomas L. Private, Company B, 15th Iowa Infantry Enlisted 28 Sep 1864, mustered 28 Sep 1864, mustered out 15 May 1865 at Washington, D. C.
Moore, William Private, Company L, 126th Ohio Infantry Unknown - "Civil War Veteran" on tombstone. Morgan, Napoleon Bonaparte Corporal, Company E, 2nd Missouri Infantry, Army of the Confederacy Specific service record unknown. Morris, Robert Private, Company B, 34th Iowa Infantry Enlisted 13 Aug 1862, mustered 15 Oct 1862. Transferred to Company B, 34th Consolidated Battalion, 12 Nov 1864. Murphy, Henry Clay Private, Company G, 84th Indiana Infantry Enlisted as a Private on 21 August 1862, mustered 21 Aug 1862, promoted to Full Commissary Sergeant, mustered out 14 Jun 1865 at Nashville, Tennessee. Myers, David S. Private, Company K, 2nd Illinois Light Artillery Unknown - "Civil War Veteran" on tombstone. Maintained by the County Coordinator This page was created in Oct. 2004. This page was last updated Thursday, 08-Nov-2018 16:32:18 EST .